PetStaurant owner Marc Ching draws on his background as a fourth-generation Japanese herbalist and holistic nutritionist to bring sick cats and dogs back to good health. His store features food prepared in-house that organic, hypoallergenic and without gluten. 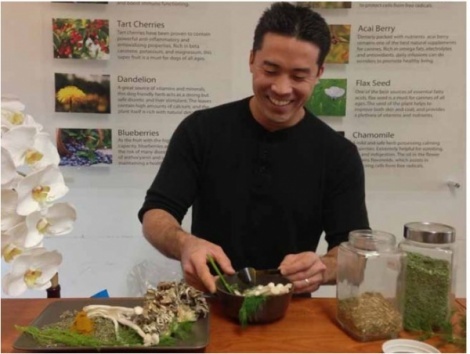 As the lead nutritionist, Marc brings eastern medical methodologies and homeopathic healing of animal ailments through healthful individualized real food diets. Marc creates species - appropriate meals for both dogs and cats, understanding the anatomy of animals and how their bodies process and absorb nutrients. Marc has three Top Tips for Preventative Pet Care through Nutrition. 1. Diet is the most important thing. Consider that humans eat a varied, diverse diet. Pets typically will eat the same food twice a day for years. If an animal eats a diet high in starch it is difficult to digest. Avoid grains, rice (brewer’s rice), soy and potato unless you have an older dog. When buying store-bought food look for low starch ingredients with minimal grain and moderate protein. I recommend a protein range in the low 30s or high 20s. Also check out the ingredient list and look for meat as the first ingredient listed and make sure there are not 10,000 ingredients. The shorter the list the better. I also recommend dehydrated food as opposed to kibble. Starch is added to food to make it into a kibble ball which can lead to increased risk of skin infections and allergies. 2. Probiotics are important for our pets. Whole Leaf Organics is one of my favorites as it promotes gut and digestive health and is ideal for skin infections as a good preventative measure. Probiotics may be expensive but there are affordable options. Coconut oil is a cheap alternative for treating skin issues and for every 15 lbs. use 1/2 tsp maximum a day. Never exceed two tsp a day. Apple cider vinegar for pH balance and digestive health etc. is also a great solution. 3. Enzymes are also ideal to aid in digestion. Whole Leaf Organics Purify Enzyme helps bloat, digestive problems, gluten intolerance and food allergies. Enzymes are an easy way to help your pet feel better and cleanse their digestive tract with the utilization of natural enzymes and plant based herbs to strengthen cell integrity and structure. For more information please contact Jennifer Humphrey at Kip Morrison & Associates or go to www.thepetstaurant. 7 symptoms of allergies in petsFelines and Fleas: A Dose of Prevention is KeyIs Raw Food Right for My Pet?